There are some forms of dental disease that can lead to the nerve inside the tooth becoming infected or inflamed. This may cause a severe tooth ache, sharp hot or cold sensitivity, or a pimple or ulcer on the gums which is reoccurring. To either eliminate these symptoms, or in some cases to prevent them from happening, a root canal treatment can be performed. At Fenton Dental, we complete root canal treatments over 1-3 appointments each a couple of weeks apart, depending on multiple factors. 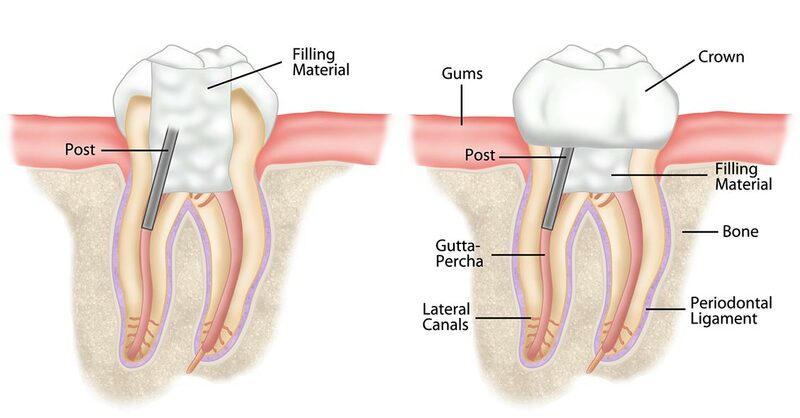 In some cases, teeth can become brittle after a root canal treatment. Given that these teeth are often the teeth in areas of high biting pressure, that may mean over time they could break. If we feel that this is the case, we may recommend a crown be completed after the root canal treatment to minimise the risk of this happening.